This Beautiful Grace: Quiet Moments? I have been watching a good library video little-by-little as I sort clothes and fold laundry. It is called "Be Still." I found it at our library. It is just a conversation with several well-known Christian voices about the practice of being still before God - of the power and value of contemplative prayer. Listening to Max Lucado, Beth Moore, Richard Foster, and Priscilla Shirer talk about being quiet has been good for me. I have been hungry for some deep stillness in my days. This video was just another "grace pocket" from God on the journey. One of the things they talk about is why we are afraid of being still. They talk about people not wanting to face themselves and the things that God wants to change in them. This morning, I woke up before my alarm and as I tried to go back to sleep, I realized that I felt very awake and maybe this was a nudge from God to get up and talk to him in the dark, quiet house. As I meditated on the thought of being quiet and still, I realized why I have a difficult time being quiet - even in my devotions. I'm afraid I won't be productive. In this house we have a very high respect for sleep. All six of us learn better, think better, love better and get into less trouble when we have let our bodies have the rest they need. Our family gets up at 6:30 am and my body needs at least 8 hours of sleep to function at its best. So unless a miracle happens and I get to bed right at 10:00, I usually choose to sleep until 6:30 and do "early morning" things like exercise and devotions later in the day. I actually love the feeling of getting up early to exercise or get a head start on things but it's only a good feeling if I've had proper sleep. So with all of that in mind, when I do get up before the family and have quiet time, I want it to be good! I want to feel that done what I need to and disciplined my mind and entered into his presence and had productive prayer. And I do believe that it helps to be disciplined and structured in our quiet time, but it is difficult for me to let go and just sit because my mind just w a n d e r s. And I think...if I'm not going to accomplish something in this quiet time, I'd rather be in bed! Obviously, there is a balance to this as in all of life. I think having a short phrase of Scripture to lasso my mind when it wanders is a good thing. And as my junior high teacher said years ago...."You never know, God might be in those mind wanderings!" One recent prayer time was the walk-the-floor-and-cry type, but this morning was the try-to-keep-focused type. And it was good. I had to trust that it was enough. I put Scripture into my mind, prayed and met with Him. No tears or fireworks. Just quiet. Over the last 10 years full of babies, I have learned to let go of legalism and worship in the everyday - to pray during dishes and worship at the sunset and memorize scripture along with my kids. I accept the seasons of life and embrace them. But I'm not as good at being still as I want to be. It seems that I especially crave stillness this time of year. I found some good resources a few years ago that are good for really being quiet and helping the mind to be still. A couple of other things that have helped me a different times is to walk while I pray. It helps me to stay more focused and has the added bonus of keeping me awake! A prayer list has also helped to make my quiet time more effective...it helps with that feeling of not knowing quite where to begin and keeps prayer moving along. I love to look back over the years in my prayer book. 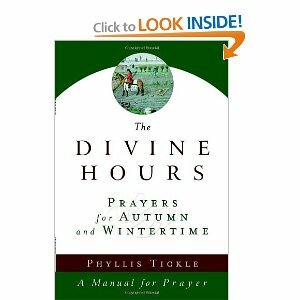 "The Divine Hours is simply the best bood for people who want to work prayer into the fabric of their daily life." ~ Bert Ghezzi, Author of Voices of the Saints. This is a very "liturgical" book - meaning it is planned readings for certain times of the day. It is called "A Manual for Prayer." It includes loads of Scriptures, readings & prayers for each day throughout Autumn and Wintertime. I love it. Ann Voskamp suggests stopping at regular intervals throughout the day to pray. This book is set up that way....a reading for early morning, mid morning, etc. I simply use it as a great resource for good Scriptures, thoughts and prayers for the day. Organized into daily readings for the four weeks of advent: Anticipation, Hope, Patience, Obedience. With readings, reflections, hymns, prayers and room to journal and sort through your own quiet thoughts. 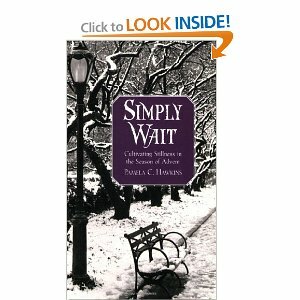 The author shares a story about attending a quiet prayer retreat at the beginning of Advent. Her thoughts have got me thinking. I love that God is okay with me finding my way through the balance of disciplined quantity and quality quiet time with Him. I am accepting His grace and REAL RELATIONSHIP instead of an unhealthy preoccupation with rules. But I am overwhelmingly grateful to Him for ever drawing me - for making me hungry for Himself. Oh my Sarah - this blog spoke to me in so many ways! Even though I know I am not in the same "place" in life as you are, I so need to learn a way to "Be Still"! Thanks for the blog!